Copenhagen remains the primary hub of Scandi-fashion despite reorganization and an ever evolving market. During the opening day of the Copenhagen fashion week, it was evident that the heat would not deter anyone from showing up wearing their sunday best. And among the plethora of designers showing on the first day of the CPHFW these three stood out the most. Anne Louise Faurholt and Emma Lohmann's Résumé is a brand that embraces it's scandi-roots like it's going out of fashion (it is not). But it would be unfair to pigeon hole Résumé into one singular identity as it has some substantive layers hidden underneath it's minimalism. Finding the right equipoise between slow and high fashion, and tailoring it to fit the budget of the average look-conscious consumer is a hard balance to achieve and with each collection Résumé moves incrementally toward that holy grail. This SS19 collection was a shot in the right direction as it brimmed with poise and color, and a very clear understanding that Anne Louise Faurholt and Emma Lohmann are both coming into their own as designers. Barring unforeseen event Résumé is here to stay and sell you something wonderful for your wardrobe that does not veer off from its roots but remains globally appealing. Mykke Hoffman is the brainchild of childhood friends Sedina Halilovic and Jelena Hofmann. Their ancestral balkan aesthetics but not structure played a consistent role in MH's collection. The ever-furled yellow and consistent use of danish structure in silhouettes makes MH a brand to watch out for in the long run. The beauty of the clothes is undeniable, the idea behind is praiseworthy and the fact that it is coming into the market with a very transparent supply chain, is wonderful. While of the pieces would get lost in the crowded filed of strong lines and minimalist fashion of Scandinavia, some the pieces like the Yellow and white machine-cut dresses will provide a lot of understated glamor for the right consumer. Simplistic color palettes over sized shirts are bound be the crowd pleasers in Scandinavia but the stand among the pieces were surely the grey printed dress that had all the elements of what makes MH a brand for the future. 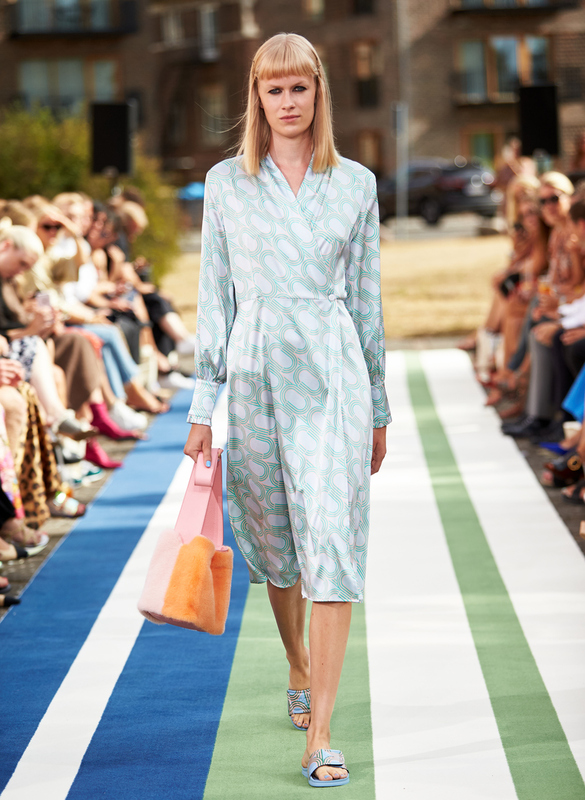 If the first two stand out designers were relatively new to Copenhagen fashion week, then Oh! Copenhagen is the old stalwart. Oh! Kopenhagen Fur presented an interesting SS19 collection, named Generations. Drawing on inspirations from the 1970’ies silhouettes and aesthetics as well as the mentality of the 1990’ies combined with elements from a younger generation. Oh! Kopenhagen Fur’s campaign model for SS19, Laura Hagested, has created hand-drawn patterns for the lining and silk pieces of the collection. The actual collection offers outerwear, silk pieces, fur and leather accessories as well as furry slippers. The color palette was easy and fresh with 70’ies inspired pastel prints and classic tones of black, beige combined with colored fur. The silhouettes were easy-to-wear along with a few more fitted pieces, all with a certain 1970’ies flair. At times, the collection felt overwhelmingly retro, and perhaps the inspiration could have been less literal, however, it had several stand-out pieces like a green oversize jacket with pink fur cuffs with the cute little pink clutch and the classic black trenchcoat with visible white seams and black cuff. A blue layered silk coat along with athleisure pants was another stand-out piece along with the draped backless top styled with black silk trousers. Oh! Kopenhagen Fur delivered a solid SS19 collection that will speak to a whole variety of women as well as excite its loyal followers. Oh! Kopenhagen Fur is a brand that continues to evolve and it's truly exciting to see its evolution.